Bruton is a settlement on the River Brue. It is in Somerset, between Frome and Yeovil. STC 928G is a Bristol RESL6G, new to Accrington Corporation Transport in 1969. It has East Lancs B47F body and passed to Brutonian in 1982. The fleet number and Accrington livery were so near Brutonian’s requirements that neither was changed. The operator became part of the Cawlett Group and is now part of First. We see the bus parked in New Canal, Salisbury, on 17 April 1984, having come in on a market service. 4 vehicles were acquired by Brutonian in 1982 from Hyndburn as successor to Accrington CTD. The vehicles were reliable and popular and the livery was retained and looked attractive as can be seen from Pete’s photo in Salisbury. 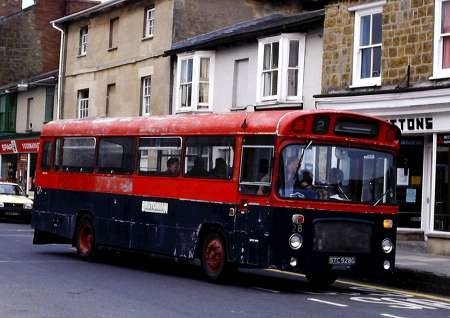 None were ever repainted and by 1987 the livery had deteriorated as can be seen from the attached taken in Dorchester. Keith and Keith, Your photos suggest that this vehicle was on its way to a breaker, rather than in service. Given what became of Brutonian, one might wonder if it’s a ‘practice’ for the Barbie livery! Perhaps we should have a section for the worst presented buses- "battered buses"? Even on the original photo, you can see the untreated deterioration around the "peak" and front wheel arch. The grille was starting to go on the first pic, and then… Brutal! How could a vehicle so neglected be allowed to operate? What about the vehicle examiners and the traffic commissioners? I don’t think I have ever seen a bus operating in such a sad state, and the final shot was hopefully before scrapping – it would have been a mercy killing. Brutonian, with the emphasis on the ‘brute’. Thank goodness for operators like Safeguard at Guildford. To be fair – maybe – things were different then in particular the powers that be were more concerned with de-regulation and local authorities had to ensure non-commercial services would continue. 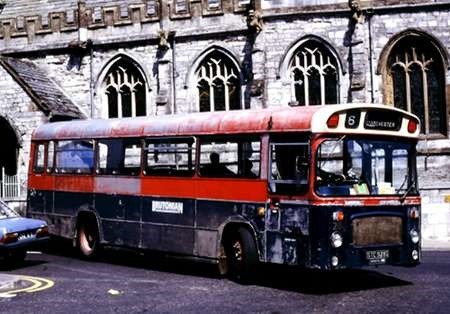 The owner of Brutonian had agreed to sell to a local businessman whose interests included a travel agency and the transfer was delayed until de-reg ie end of October 1986. As well as existing routes and new commercial ones , the new company had gained additional tenders – not least the trunk route 6 between Sherborne and Dorchester. Despite the poor external appearances , the REs were apparently mechanically sound and reliable and the additional work probably extended their lives. Unfortunately the 6 passed County Hall and comments were apparently made therein !! No 28 was withdrawn soon after the photo was taken and continued concern saw the tender itself subsequently transferred the following year to another local operator. Attached is another photo taken in May 1985 in Castle Cary on the Saturday evening Bingo service and is probably how these fine vehicles should be remembered. A new book on Brutonian concentrating on the routes and operations is to be published soon through the Omnibus Society. I think ‘the ugly face of de-regulation’ is a term that sums up this situation. A similar thing happened in the North West where the once proud Yelloway having been asset stripped by new owners secured a tendered service into Manchester formerly run by the PTE. They used very unsavoury looking cast-off Bristol VRT/ECW vehicles in worn out ex NBC liveries with no fleetnames and paper stickers in the windscreens as a destination display. It was a disgrace. Fortunately the powers that be stepped in fairly quickly and terminated the arrangement with the service being re-tendered. Not the British bus industry’s finest hour. I have read that Brutonian only repainted vehicles when they were in for other maintenance, resulting in the most unreliable ones being repainted first and vice versa. So looking at the state of this one, Keith’s comment about its mechanical soundness rings true! Chris Knubley the owner of Brutonian never really had much money. 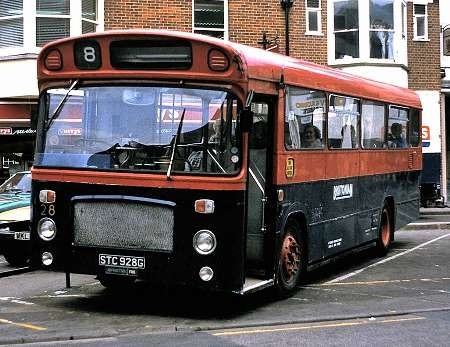 There was an injection of money into the business in 79 when he bought his first RE (GAX 5C – a great bus!) and CYA 181J (survices) along with WYD 928H from H&C, the latter was never painted. Generally the most reliable buses were painted 217 UYC and 497 ALH for example, while others ran in a range of former operators colours 8087 TE and TET 166, for example. Not creating consistency was something he had done from 1972! There was clearly something wrong with the last paint job done by Hyndburn on MTJ 926/927G and STC 928/928G. Alternatively the guy who replaced me washing them down from Sep 82 was using the pressure washer incorrectly, or it had been inadvertently fitted with the sandblasting nozzle! 27 became the donor to the others although lasted until a few years ago along with 26 and 29 in Shobdon before final scrapping. 28, in the picture, I understand was in fact the most reliable and went onto be repainted and see further service with Metrowest (the only one of the four). It was indeed different times…I now own the only bus to carry the Brutonian colours which is OVL494, an identical bus to Brutonian’s OVL 495, which was scrapped after an attempt to convert it to a half cab. All other survivors are in original operator colours or in CYA 181J’s case, awaiting restoration. Yes deregulation did the bus industry no favours and we are still seeing the repercussions over 30 years later. Fishwick’s and Pennine spring to mind. Much information about Brutonian may be found here:- http://www.countrybus.com/Brutonian/BrutonianPart1.htm Scroll to the bottom for links to further pages. On 10th February 1925 The Greyhound Motors Ltd introduced an express stage service between Bristol and London. It was apparently an immediate success despite the GWR railway between the two cities. In 1928 the company was acquired by the Bristol Tramways and Carriage Company later renamed the Bristol Omnibus Company but the Greyhound name remained in use until 1973 when it was replaced by the NBC corporate National image. 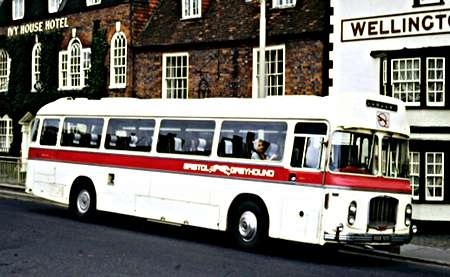 A 1970 timetable recorded a total journey time of 4 and 3/4 hours for most services via Bath Chippenham Newbury and Reading which included a 15 minute comfort stop in Marlborough. The photo taken in 1972 in Marlborough shows one of the 1968 Bristol RELH6L coaches which were originally delivered in the red and cream livery and briefly repainted into white and magenta with a revised Greyhound motif. Nice view, Keith. Thank you for posting. Did any of the ‘captive’ Bristol/ECW fleets have any coaches with toilets, as Standerwick and Midland Red did? The CAPTCHA code for this comment may well set hearts afluttering in Southdown territory: 5UUF. The T-style destination on Bristol Omnibus Company’s RE coaches gave a very distinctive touch to a classic body design. The greyhound motif on the number box on this example is a nice touch. Marlborough, was also an interchange point, between Associated Motorways Services and Royal Blue with Greyhound, they had a large shop with a cafe, waiting room, and booking office in the main square. It did not appear in the time table as such, but if you phoned ahead they would hold connecting service until you arrived, passengers would be informed this would be an extra [with 10 bob being spilt between drivers, by regular passengers who knew this to be so] cheaper than a taxi. Toilets on Greyhound coaches, no, only those stationed at St Marks, which sums them up, end of life, one season at St Marks then the scrapper, if they where ok they would have been converted into DPs for Bristol and Bath. Thank you, Mike, for your comment about toilets on these vehicles. Any thoughts, please, from anyone about the facility on coaches in other "Tilling" fleets? Pete, I’m going to stick my neck out and say "no" . . . in so far as "proper" Tilling fleets were concerned. But, THC-wise, I’m sure SOL had some Bristol RELL/Alexander Y-types (which pre-dated the M-types) fitted with toilets for its Edinburgh-London overnight services. Hang-on! didn’t Western SMT fit toilets to some of its coaches (Alexander/Guy LUFs?) to counter Northern Roadways toilet-equipped coaches on the Glasgow-London route? Where’s my Northern Roadways book . .
Bristol Greyhound RELH6/ECW coaches to the best of my knowledge never had the luxury of toilet facilities, relying on numerous breaks at the many stop-overs on the way. On checking most other Tilling fleets with long distance coaches, even United Autos did not have them on their long distance Newcastle-London service. In fact the only ECW bodied vehicles I know of that did would be the 30 Bristol VRL/LH6L megadeckers with Standerwick used on the non-stop routes from the North West to London. 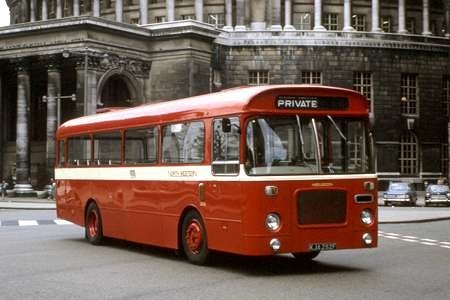 The Bristol RELH6Gs used on the Edinburgh and Glasgow routes all had toilet facilities but they had Alexander M series bodies. Toilets. Northern Roadways Burlingham coaches had toilets and refreshments on board but the 50% relief coaches did not, the hostess with big teapots would transfer over to dispense drinks and snacks often done in laybys on the A1. Passengers would have to wait until coaches pulled into top up fuel tanks for toilets, other operators had toilets but not refreshments. Thanks for your thoughts about toilets on the "Tilling Fleets" vehicles. Much as I thought. Couple small points, pre war SMT and Western operating Anglo Scottish services had fitted toilet compartments to their Gilford AEC and Leyland Coaches; as Did Scout and Standerwick on London- Blackpool. Northern Roadways’ plans to introduce toilet accomodation on its Seagulls led to SMT and Western reintroducing the feature, initially on Alexander bodied Regal IVs, SMT then used small engined Reliances, the later ones 36ft and Western sucessively Guy Arab UF (end an eight-cylinder Albion Prototype) Guy Arab LUF, Leyland Leopard L1 and PSU3 Leopard. Then came the RELHs (not RELLs) an the the initial M Types on REMH. No Tilling fleet had a toilet fitted coach from 1945-69 but its interesting to note that United’s RELHs only sat 43, compared to the standard 47 and 51 in the Midland General semi-coaches. United were of course the only other customer than Western and Eastern for the REMH6G, taking batches between 1971 and 1973 with C49F Plaxton bodies. In NBC days Tilling had some RELH Plaxtons with toilets.